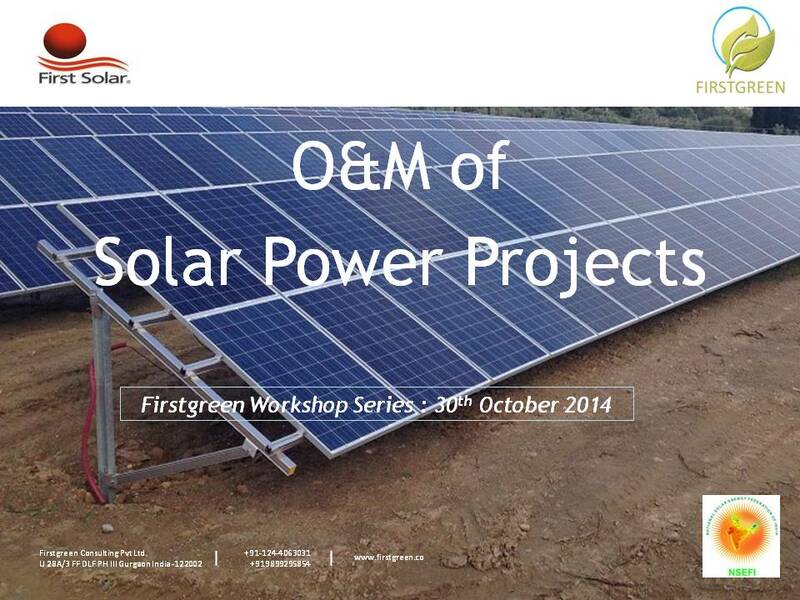 [ezcol_2third] Gurgaon 30-10-2014: First Green Consulting and First Solar Jointly conducted a Webinar on O&M of Solar Power Projects. For First Green Consulting, Solar is our passion and nothing makes it more rewarding than an overwhelming response to our webinars or to our any training program .We received 40 registrations which included people from various walks of Solar field. There were CEOs, Directors, Managers, Engineers, Professors and Students who registered with us. Dr. Sanjay Vashishtha explained the necessity of the solar PV plant Operation & maintenance and the three basic topics namely Procurement & Construction, Operation and Maintenance. Along with this, he also explained the basis structure of the solar PV plant and the core basics of solar PV design. Then later on Christoph Neufink(Director services,Skytron) explained the Preventive Maintenance (PM) in solar projects,Options to reduce the breakdowns in your solar plant,Plant performance monitoring system.The whole session of webinar mainly focused on Why O&M is important, how the O&M market perspective should be there, advancement of O&M. He also explained the designing and engineering aspects of Solar PV plant.